So far, we have learned in our tutorial how to create arrays and how to apply numerical operations on numpy arrays. If we program with numpy, we will come sooner or later to the point, where we will need functions to manipulate the shape or dimension of arrays. We wil also learn how to concatenate arrays. Furthermore, we will demonstrate the possibilities to add dimensions to existing arrays and how to stack multiple arrays. We will end this chapter by showing an easy way to construct new arrays by repeating existing arrays. The picture shows a tesseract. A tesseract is a hypercube in $\Re^4$. 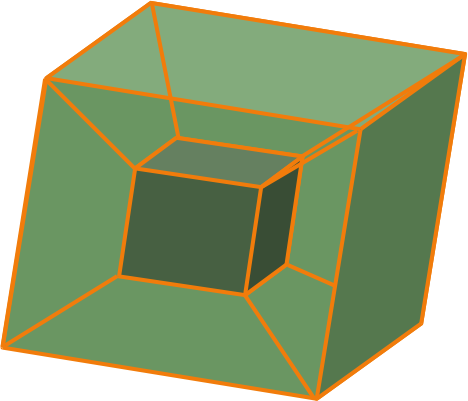 The tesseract is to the cube as the cube is to the square: the surface of the cube consists of six square sides, whereas the hypersurface of the tesseract consists of eight cubical cells. flatten is a ndarry method with an optional keyword parameter "order". order can have the values "C", "F" and "A". The default of order is "C". "C" means to flatten C style in row-major ordering, i.e. 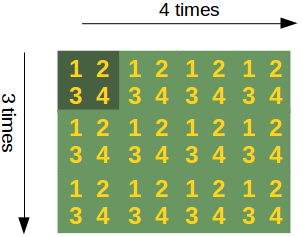 the rightmost index "changes the fastest" or in other words: In row-major order, the row index varies the slowest, and the column index the quickest, so that a[0,1] follows [0,0]. "F" stands for Fortran column-major ordering. "A" means preserve the the C/Fortran ordering. The order of the elements in the array returned by ravel() is normally "C-style". ravel returns a flattened one-dimensional array. A copy is made only if needed. 'C': C-like order, with the last axis index changing fastest, back to the first axis index changing slowest. "C" is the default! 'F': Fortran-like index order with the first index changing fastest, and the last index changing slowest. 'A': Fortran-like index order if the array "a" is Fortran contiguous in memory, C-like order otherwise. 'K': read the elements in the order they occur in memory, except for reversing the data when strides are negative. The method reshape() gives a new shape to an array without changing its data, i.e. it returns a new array with a new shape. a array_like, Array to be reshaped. If this reminds you of tiling a bathroom or a kitchen, you are on the right track: The function which Numpy provides for this task is called "tile". An array is constructed by repeating A the number of times given by reps. In the previous tile example, we could have written y = np.tile(x, 5) as well. If 'reps' has length n, the dimension of the resulting array will be the maximum of n and A.ndim. If 'A.ndim < n, 'A' is promoted to be n-dimensional by prepending new axes. So a shape (5,) array is promoted to (1, 5) for 2-D replication, or shape (1, 1, 5) for 3-D replication. If this is not the desired behavior, promote 'A' to n-dimensions manually before calling this function. If 'A.ndim > d', 'reps' is promoted to 'A'.ndim by pre-pending 1's to it. Thus for an array 'A' of shape (2, 3, 4, 5), a 'reps' of (2, 2) is treated as (1, 1, 2, 2).